A polished diamond’s beauty lies in its complex relationship with the light around it. When diamonds and light interact, the result can dazzle the eye. The main elements of the relationship between diamonds and light are how the light strikes the surface, how much of it enters the diamond, and how and in what form the light returns to your eye. Each element depends on diamond’s optical properties as well as on the quality of its cut. Long ago, cutters understood that a diamond’s primary optical display happens in and around the crown. 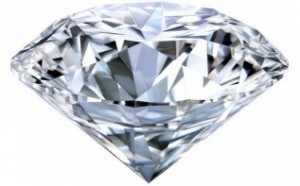 This means that diamonds are meant to be seen face-up. Motion also helps to show off a fashioned diamond’s beauty. By tilting and rocking a diamond, you can create constantly changing viewing angles. A fashioned diamond is a three-dimensional object. When light enters, it follows complex paths within the diamond. Researchers are only beginning to appreciate the complexity of light’s relationship with the interior of a diamond, and how different facet sizes, arrangements, and angles can improve or diminish the gem’s optical performance. Diamond has many properties that make it the most sought-after gem in the world Its special relationship with light provides three of those properties: brilliance, fire, and scintillation. Brilliance is the combined effect of all the diamond’s surface and internal white light reflections. Fire is the display of spectral colors created by the interaction of white light with a fashioned diamond. And scintillation is defined as the tiny bits of light that flash when a faceted diamond, the light source, or the observer moves. When diamond rough is unearthed, its brilliance, fire, and scintillation are still locked inside. It takes a lot of processing to separate diamonds from their surrounding host rock. Even after separation, some diamond crystals might have thick, dark coatings – layers of lower transparency the must be polished away before cutting can begin. A skilled cutter knows how to make the right choices to unlock the potential in a rough diamond. The cutter’s choice of faceting style and proportions converts diamond rough into a beautiful, dazzling gem.